We met Vlad, a student from Kiev, at the end of the 26th. 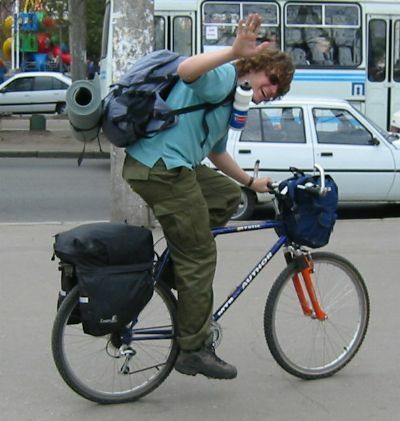 He had heard about us through a Ukrainian cycling website (www.velocity.ua) and come by bus from Kiev to meet us. He spoke fluent english and helped us enormously to communicate with the local people and learn about Ukraine. 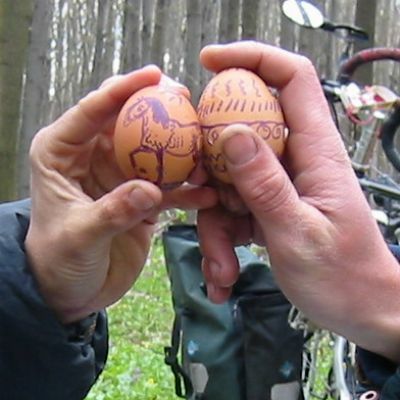 It was Easyer Sunday in the Orthodox Church so Vlad had brought us an Easter bread and showed us how to crack eggs in the traditional Ukranian fashion. 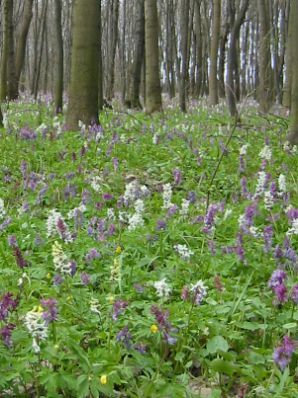 The forest where we camped was carpeted with flowers. First we begged for an easy day as we had worked hard the previous day to meet up. 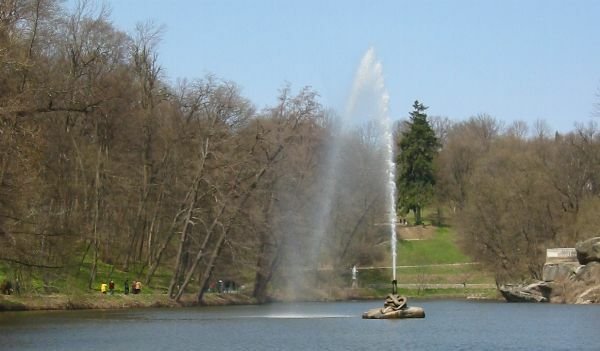 We went to Sofiyvka Park in Uman, a beautiful landscaped park built as a gift for his wife by the Polish Count Felix Pototsky. That evening Vlad showed us how to make a fire. He dug a shallow pit to contain the flames and protect them from the wind and we cooked our dinner over it, followed by endless cups of tea. We had bought a very tasty Ukranian salami sausage and washed it down with Ukranian unfiltered beer. Next day unfortunately it rained, but at least the headwind that had blown against us almost continuously since Kamyanets-Podilsky turned and became a tailwind. We stopped at a petrol station cafe for a bowl of soup and found the people there in the midst of celebrating the boss's birthday in lavish style. 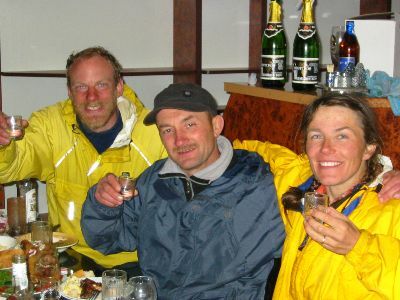 We were immediately invited to sit down and fed steaks and plied with Gorilka (Ukranian vodka). After about an hour we thought we should leave while we were still capable of riding our bicycles! A little further on we passed our 8000th kilometer (5000th mile). 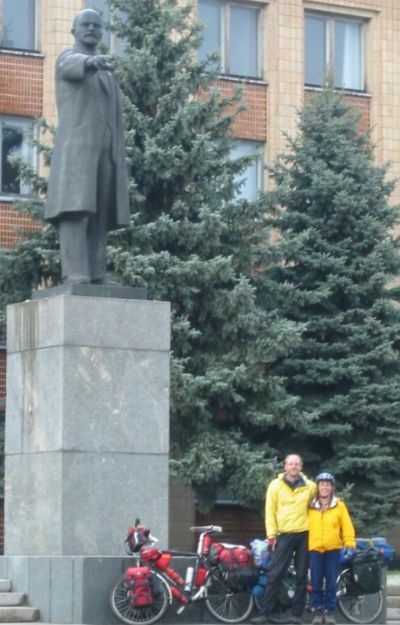 To escape the rain we decided to go to a hotel that night, opposite this fine statue of Lenin. Everywhere we went there were statues of Lenin and other local leaders. We also often saw old tanks, fighter planes, jeeps and even a tractor on pedestals. Next day was sunny again. We met this boy tapping birch trees for their sap and bought a litre from him. With a little extra sugar it made a refreshing and subtly flavoured drink. Then we were down the dual carriageway into the bustle of Cherkassy. Vlad helped us to post a parcel of our winter clothing home (there was a cyrillic form involved that baffled us) and then pedalled off to the bus station to go back to Kiev. Hope to see you again somewhere Vlad!